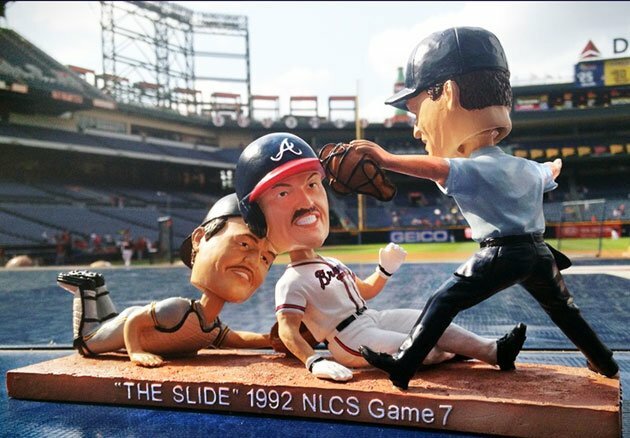 Best Bobblehead Ever: The Sid Bream "The Slide"
Not only because it's the best bobblehead doll of all-time because it features a sliding Sid Bream with the umpire Randy Marsh calling him safe and a lunging Mike LaValliere stretching for the tag but because I was at this game with my Dad. In fact a couple of years ago I gave my Dad for Father's Day a framed autographed Sid Bream "The Slide" photo for his office. It's the most memorable sports event I've ever been a part of and now the Braves will be giving away these classic bobbleheads to the first 20,000 fans who attend the June 9th game vs the Toronto Blue Jays at The Ted. It's one of those moments that you will never forget and I cherish that I got to share it with my Dad who basically taught me everything about baseball. This is just a classic scene from Wrigley Field today. Kerry Wood on his final MLB pitch throws his wicked curveball for strike three and walks off to a standing ovation. To get the juices even more flowing or tears for that matter he Cubby-bear hugs his son as he walks off the field. Major props go to the Chicago Cubs organization for letting Wood go out on his terms. From my first memory of Wood striking out 20 Astros in 1998 to this final moment I would say he played the game the right way. Ok this needs to be said about the New Era hats once and for all. The flat brims are horrible. They are so damn hideous and red neck trash looking that even the bros wear them and think they look cool. Wrong. It looks ridiculous. You look like a blind carnie with a devastating limp trying to hump a dog with that flat brim brah! So please stop it with the flat brim look and for the love of all holy take off the damn sticker. We get it. You got a new hat instead of a high school diploma. Congratulations. The $35 you dished out still won't earn you any respect so just do us all a big favor and take off the sticker. As a business owner all the flat brims with the stickers on them just stamp a giant UNEMPLOYABLE right across your ugly mug. It's basically a neck tattoo in chinese characters that translates to don't hire me. Any ways Round 2 of the Chicago vs Chicago was a giant step down from the epic round 1. I might as well post it for everyone to see. And please New Era can you make the hats less stiff. I want a relaxed fit, not a damn Shriners cone on my head. Whether it is throwing a pigskin or toking the rock RG3 has a flair for the dramatic on the football field. Off the field the #2 pick wears eccentric socks and does the beatbox on the Tonight Show. The Redskins not only found their savior but they found a guy who should be a media darling for the next decade. RG3 has charisma, talent, and can beat off with the best of them. A modern day Dirk Diggler for sure.